On Thursday, November 14, 2013 from 12:30 p.m. to 2:00 p.m., 270 middle-school students from Patrick Marsh Middle School helped return 18 acres of land at Patrick Marsh Natural Resource Area to native prairie by scattering hundreds pounds of seed of more than 40 species of prairie grasses and flowers collected that fall from local prairie remnants and restorations. This educational event gave the students a hands-on experience in the restoration of the prairie landscape that once was widespread across Dane County. The planting took place on land owned by Groundswell east of Sun Prairie along Town Hall Road south of Patrick Marsh. The planting was coordinated by Groundswell, Madison Audubon Society, Patrick Marsh Conservancy, and the Discovery Club at Patrick Marsh Middle School. The land is part of a 320 acre wildlife area on the eastern doorstep of Sun Prairie. The wildlife area is open to the public for a variety of outdoor recreation activities and is owned by the DNR, Dane County, and Groundswell. See a map of permanently protected lands in Patrick Marsh. According to Groundswell Executive Director Jim Welsh, “Community support for Patrick Marsh always has been strong. This is the latest example of the community, in the form of 270 students from Patrick Marsh Middle School, pitching in to make Patrick Marsh a better place”. Funding to purchase and plant the seed came from Patrick Marsh Conservancy, Patrick Marsh Middle School Discovery Club, Dane County Environmental Council, Sun Prairie Rotary, and Groundswell members. Groundswell is a local non-profit conservation organization that works in partnership with private landowners and local communities to protect important natural resources in Dane County and the surrounding area. One of the oldest land trusts in the state, Groundswell has permanently protected more than 10,000 acres of natural areas and working farms. 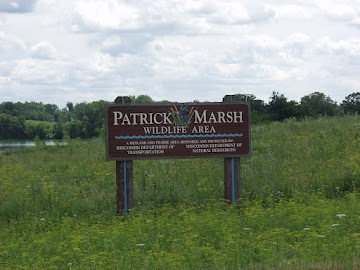 If you would like to support the work at Patrick Marsh, please donate to Groundswell and write “Patrick Marsh” in the message area.